Bloating and nausea are less common symptoms. Indigestion is NOT the same as heartburn. Rarely, the discomfort of a heart attack is mistaken for indigestion. Allow enough time for meals. Avoid excitement or exercise right after a meal. Chew food carefully and completely. Relax and get rest if indigestion is caused by stress. Avoid aspirin and other NSAIDs. If you must take them, do so on a full stomach. Medicines you can buy without a prescription, such as ranitidine (Zantac) and omeprazole (Prilosec OTC) can relieve symptoms. Your health care provider may also prescribe these medicines in higher doses or for longer periods of time. Get medical help right away if your symptoms include jaw pain, chest pain, back pain, heavy sweating, anxiety, or a feeling of impending doom. These are possible heart attack symptoms. Your indigestion symptoms change noticeably. Your symptoms last longer than a few days. You have sudden, severe abdominal pain. You have yellow coloring of the skin and eyes (jaundice). You vomit blood or pass blood in the stool. 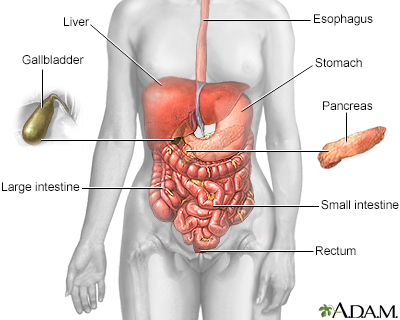 Your provider will do a physical exam on the stomach area and digestive tract. You will be asked questions about your symptoms. Tack J. Dyspepsia. In: Feldman M, Friedman LS, Brandt LJ, eds. Sleisenger and Fordtran's Gastrointestinal and Liver Disease. 10th ed. Philadelphia, PA: Elsevier Saunders; 2016:chap 14.